In this installment of the MIDI for the Arduino series, we are going to assemble a Midi Output Circuit and connect it to your Arduino UNO. This circuit is as easy as it gets. Next we'll create a simple test program that will verify that everything is working. Download the file HERE. 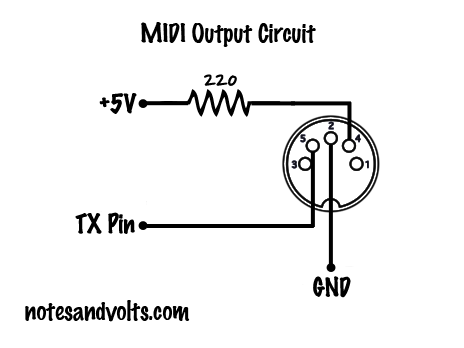 If you're new to this series, check out the first article where we look at how a MIDI circuit works. This will help you understand what you are building here. I am assembling the circuit on a small solder-less breadboard. The video will walk you through the steps of putting it together. Take your time and double check your work. Good luck! Would a 1/4 watt 220 resistor work? I have those and they are a just a little smaller then what you show in the video. I'm guessing you used a 1/8 watt resistor. That's great news I'll give it a shot! i would really appreciate if you could upload the midi controller code for arduino mega 2560 as well. Hi, First of all thank you for such a solid tutorial. I built the circuit as described but for some reason it does not play any note. 2 - MIDI jack I have is different from yours too, it is not 90 deg but straight, so I had to solder 3 wires to it to connect to the breadboard. Other that that everything else seems to be ok. The program uploaded into arduino no problem and the LED(13) is blinking as on your video. Thanks for your tutorial . I tried this today but it doesn't work. Everything is the same: wiring, software ,Arduino version ecc.. The TX led and led13 led blink but nothing is sent .Any help?